Hope this kind of thread is allowed here! I’m super interested in buying Affinity Designer for the iPad. Keyboard shortcuts are kind of a big deal for me and could decide whether I purchase or not. 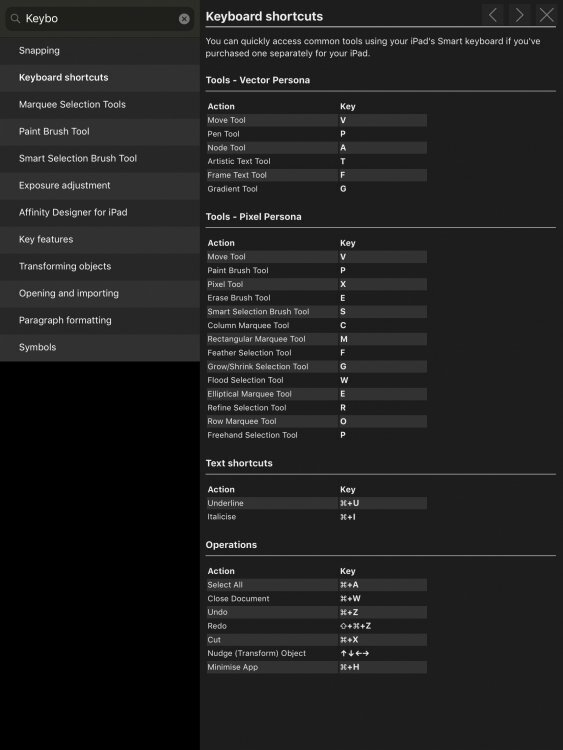 From what I understand the iPad version does support shortcuts (keyboard cases), but could someone please provide a full list of what shortcuts/commands are available? I've searched online but can’t find anything. Are shortcuts the same as the macOS version? Here's a screenshot with all the shortcuts you can use on the iPad.